Was everything I was looking for and my grandson's love it!! A plush and affordable addition to any bedding ensemble, this comforter is made from premium polyester materials for a soft touch. Hypoallergenic down alternative fill provides lightweight warmth that's perfect all year-round. Dimensions 20.0 In. X 25.0 In. X 10.0 In. I have been searching for a solid colored comforter for the past few years and finally found this one. I am a cold natured person so the fact that this is made with polyester helps keep me very warm at night. The polyester fabric also means that it is easy to clean any dirt that my pets may bring with them from out side. It's easy to wash and dry and even easier to put back on the bed when I make it up. This is a fairly nice comforter. It has good, solid, invading color, but that's probably because it's microfiber. I've had mine for 6+ months. Been washed many times and the filling is still in the same place. I have a long, it's not quite long enough on the sides for my taste, it just barely covers the bottom of my matress, and in the front of the bed it doesn't cover the matress at all, just the edge/corner. I wasn't able to find a sham to match, but maybe I didn't look hard enough. The comforter is not heavy, so if you just want a nice cover without "weight" then you will like it. My husband and I are tired of microfiber, we''re going back to cotton. This comforter is a very good, low-cost option for almost any bed. I tend to replace comforters frequently because of my kitties "kneading" them with their little claws, so I don't want to spend $200. This comforter is square (88 X 88, I think), so you don't have to find the right end to make your bed. The color is a deep rust that matches the pillow cases and sheets I already have. The material is polyester, so I expect it to machine wash easily. Great color,fit and top stitching on the quilt....love it ! The color was very nice,love it!! Although its a little thinner & lighter than i expected it to be but its just right for my 4 year old to use year round.. Would have love a pink 1 for her but the blue is a good change for her all pink room! This is a light down alternative comforter which is exactly what we wanted. Not too heavy but keeps you warm in the mild winters here in the South but also comfortable in the summer with the AC. I bought a cream comforter. It was a nice cream, not too yellow or too white. I would consider it on the lighter side for a comforter, but it wasn't too thin. I did not see any seams/threads that were loose or places messed up on the comforter. However, the packaging zipper was busted on 2 of the 3 comforter plastic covers. Overall, I was pleased. Very nice all year comforter. The color gray is little different from the picture here. It is a different kind of grey. Very thin comforter with lumpy padding and uneven padding. It was so inexpensive, it isn't even worth repackaging to ship back. The seams are coming undone, you can see through the material to the padding material inside. Not a 'comforting' comforter. I bought this comforter for my son, and decided I wanted to buy myself one. Very soft and comfortable. Washed it already and it did fine! If you are looking for a super soft comforter, this one is it. I paid $29.99 for a full size and am very pleased. It did arrive VERY WRINKLED but I used a steamer on it and it now looks great! The down alternative comforter was a lot lighter (weight) than I expected. I will only use it as a summer cover. When I washed it, it came apart a few places at the top seam but I still use it. But gets so wrinkled right away. I purchased 3 similar comforters from Overstock. THis is the one I liked the best so I am reviewing it. Much nicer than I had anticipated! Flimsy and too thin, I am not sure how it will last. Very comfortable and warm, only had the item for a couple of months and some of the stitching is already coming out. Kind of expected though as nothing is built as strong as it used to be. Holds its color nicely even after a couple of washes. Delivery was fast and easy. 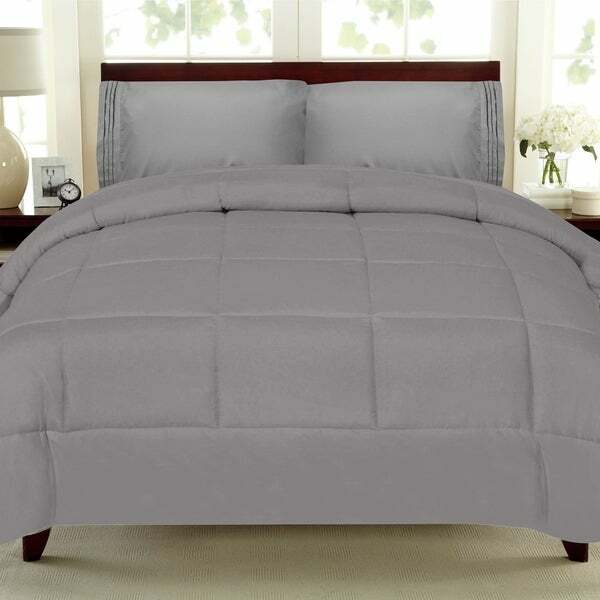 This is a perfect lightweight comforter! The quality is excellent and the price is amazing! It's a great alternative for warmer months, and it still completes your bedroom décor beautifully. This one is a purchase you definitely won't regret! "There are 2 sets one with shams one with out. So apparently you should be able to get shams some how?" Unfortunately, we do not sell the shams separately, the set comes pre-packaged. "is it comforter pure white ? " Yes it is a very pure, clean white. "I wasn't aware that this comforter didn't have the shams.where do I get the shams to match?" I honestly don't know. I did not think of purchasing the shams. Good question though. Sorry. I agree the picture shows shams so they do igsist but where? "I just received this very large item and I think I read that I should be washing it before using it. Is this really true? And is there some special way to wash it the first time the way there is with towels?" I have this comforter and I have washed it several times. It gets softer with washing but has held up really well in the washing machine and dryer. wash it along If you wash with something else it might get lint balls on it. "Is there a bed skirt to match this in grey"
There is no bed skirt. Just the Comforter. ITEM#: 19424544 THIS IS AN OVERSTOCK ITEM. THEY HAVE DARK GREY AND IT MATCHES THIS COMFORTER. THEY HAVE THEM IN ALL COLORS AND SIZES. I LOVE THE ONE I BOUGHT. Add a classical, finished touch to your bedding with this Merit Linens pleated bedskirt. The beautiful, lightweight dust ruffle is crafted from machine washable microfiber, and is available in a variety of colors to perfectly suit your decor. The pleated corners give the bedskirt sharp and clean lines, making this ruffle the perfect way to hide unsightly bedposts and under-the-bed storage. "I would like to buy the matching shams but i cannot find it on website. Please help"
We currently do not have a pillow sham on the site that is designed specifically for this comforter, however item# 11798451 or 12350084 might pair nicely. This item does not include the shams. Please contact us at 1 (800) 843-2446 for help with your order.